Happy Monday - a fresh new week has landed! Every Monday I'm sharing a reading for the week to see what energy is at play and how we can work with it, along with some extra added guidance at the end of the post. I hope you enjoy these weekly readings as much as I do! This week I'm pulling a cards from the Mystic Mondays Tarot and Äkta Spåman Podcast Oracle - two decks I also need to review here soon. I'm majorly behind, haha! The energy this week is coming from the 3 of Wands and I love this card! It's one of my favorite cards to see show up in a reading - it encompasses preparation and expansion for me. The 3 of Wands tells us that it's time to get your creative ideas off the ground and into focus. You are ready to take the next few steps towards your vision but may have a few things to look at before you are fully ready. I like to use the energy of this card to proof read any writings I have in my drafts, double check over projects to be sure I'm not missing something, or to make sure I have all the tools needed to move forward (this includes study and awareness on what I'm working on). So use this week to dot your i's and cross you t's! When moving forward with something there will always be a struggle of some kind whether it's with people in a group, someone expressing their opinion, or even just internal conflicts with yourself (ahem, doubt can do this). The 5 of Wands is a good reminder to not waster our energy in dealing with feuds that really have no point. Yes, it's totally healthy to have arguments and a conflict of interest, but not when tension comes to the party. No need for this to turn ugly! We can all put in our own two cents while still acting responsibly and respectfully. If someone does raise hell, move on and don't look back. I pulled a card from the Äkta Spåman Podcast Oracle for some extra added guidance this week. 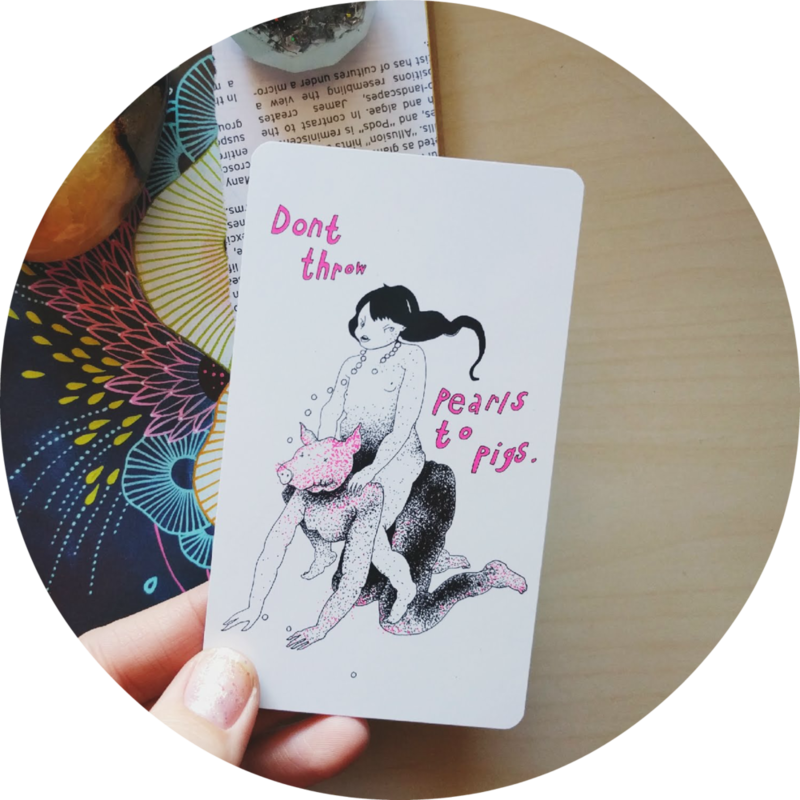 "Don't throw pearls to pigs" is such a true statement and really ties in with the 5 of Wands I pulled above. Just like I said how we don't need to deal with feuds that have no point, we don't need to feed into them either. Sometimes it's best to just let people be and ignore their behavior all together. By continuing to feed into a negative situation, we are still involving ourselves and it's not helping anyone. This can be like trying to get in the last word or struggling to explain yourself... just move on and let them be. If they are genuinely reaching out for help, that's one thing. But the second someone turns ugly, don't waste your breath and just keep moving.